It’s not only digital billboards that can collect information from passing drivers. Old-fashioned static signs too are already being linked to the smartphones of passing drivers. If you are using Waze and you pass a “Geo-fenced” billboard, that billboard will send its graphic content to your smartphone screen, duplicating the billboard’s message, and suggest that you go to the nearest branch of the business advertised. No, we are not making this up! It is being done on a trial basis in Southern California already, a partnership between Waze and McDonald’s. 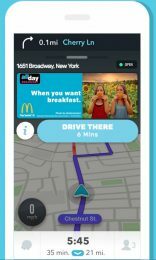 Here’s how it works: You stop for more than 4 seconds at a traffic light near a McDonald’s billboard, and the billboard content appears at the top of your Waze screen, together with directions to the nearest McDonald’s. It’s making money for the company. 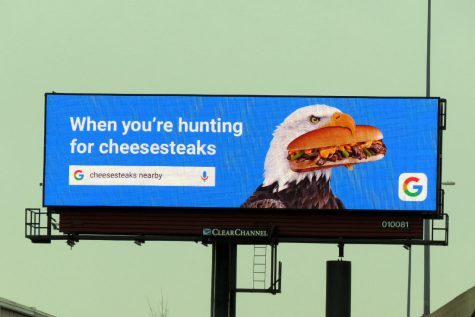 During a two-month period last year, 1.9 million unique users passed these Geo-fenced billboards in SoCal, and 8,400 people actually clicked on the duplicated billboard on their screen, changed their destination, and drove to a McDonald’s. This makes driving more dangerous for all of us. This app is causing thousands of people every day to look even longer at their cell phones while they’re driving. The service is called Zero-Speed Takeover. It’s one of the many methods that Waze uses to integrate ads into your driving experience, along with arrows, pins, and promoted searches. It’s yet another reason to oppose billboards along any roadside. Los Angeles is about to suffer an invasion of a new kind of advertising. These signs change every 8 seconds, just like digital billboards. Some of them are even animated. They’re made by a startup called Firefly, which just got $21 million in venture capital for a pilot launch in S.F. and L.A. Drivers can voluntarily bolt one of these atop their cars and earn money for each day driven. We already have ads on bus benches, bus shelters, street furniture, and businesses. Not to mention the thousands of billboards that litter our streets. These new Firefly signs have started to appear, taking digital advertising into literally every residential neighborhood in the city. The City Attorney filed a brief late last year saying that these signs violate the California Vehicle Code, because flashing, changing, and animation are prohibited on vehicles other than turn signals. And then L.A. Council Members Blumenfield and Harris-Dawson wrote a motion (Council File 19-0104) urging the City Council to follow state law and instruct the LAPD to start enforcing a ban on these signs. Thank you, council members. Of course they did. Firefly commissioned a legal brief which alleged that the City Attorney was misinterpreting the Vehicle Code. And that the signs are a source of revenue for drivers. And that the signs can be used for emergency and public service announcements (as if we needed them). The council members’ motion is now before the City Council Transportation Committee. It needs some positive reinforcement. Send an e-mail message like the one below to the committee secretary: john.white@lacity.org and mention the case file in your subject line: 19-0104. Send a copy to your own council member also if you like. Please convey to the members of the Transportation Committee my support for the motion offered on 1-29-19 by Council Members Blumenfield and Harris-Dawson. I too oppose the incursion of an entirely new form of digital advertising onto our streets. These “Firefly” signs are dangerous, ugly, distracting, and even illegal under the California Vehicle Code. 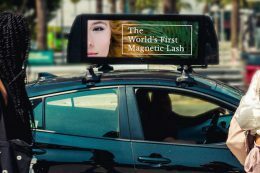 Our visual environment is already burdened enough with the clutter of advertising, and these signs will take rotating digital ads into every neighborhood of the city, including residential neighborhoods where they have never been before. We need to stop this now before it spreads any further. The motion will come before the Transportation Committee in the next few weeks, and then it will go to the full council. The time to write is now. There’s good news about AB 1405, the plan to insert digital billboards among California’s highway road signs. The bill was scheduled for a hearing on Tuesday, June 19 before the State Senate Transportation and Housing Committee, but it was pulled from consideration at the last minute by its sponsor, Assembly Member Kevin Mullin. This means that the threat is over, for now. To all who wrote in to Sacramento to express opposition to AB 1405, thank you. We will remain vigilant, because this monster could come back like a sequel to a Grade B horror movie. Digital Billboard Ads could be coming to California Freeways if a bill now before the State Senate becomes law. The above picture came from a Caltrans report favoring the idea that was released on April 16. Caltrans has teamed up with a couple of select billboard companies to actually propose this ugly and dangerous idea as a means to raise money by selling ads on highway roadside official signs. This is what the ads would look like. Alongside the usual traffic notices, or even mileage distances, we would get changing digital advertising alongside Caltrans controlled freeways. The proposal so far is for a pilot project, but even this idea should be shot down before it gets any further. Caltrans justifies the trial by pointing to the FHWA study which allegedly found that digital billboards are safe. But we all know that that study was never properly peer-reviewed, is flawed, and is outdated because of the increasing in-cockpit driver distractions that come from on-board touch screens, direction finders, and cell phones. More recent 2015 studies have found that digital billboards resulted in 25% to 29% higher crash rates near such signs in two states, Alabama and Florida. So Caltrans and the billboard companies are deliberately putting drivers and passengers in danger with this proposal. Caltrans does not even need the money. The state budget has been in surplus for several years, even while the rainy day fund increases. And California drivers do not need the distraction, danger, and mere ugliness of more ads. What to do: The legislation is AB 1405, The Advanced Digital Network Act. Right now it’s before the State Senate Transportation and Housing Committee, chaired by Jim Beall. Send letters via e-mail to the committee via the secretary Katie Bonin: katie.bonin@sen.ca.gov or fax to 916-445-2209. The City Council Planning and Land Use Management Committee (PLUM) has finally come up with the text of a proposed Citywide Sign Ordinance, and it realizes many of our worst fears. The new bill (Council File 11-1705) unveiled on Dec. 12, allows new digital signs outside the high-density commercial Sign Districts. Specifically, it allows such billboards in almost any type of commercially-zoned business property. This means that if the bill passes in its present form, the sign companies could erect a new digital sign, with messages changing every 8 seconds, on nearly any commercial lot that they deem worthy. It also allows on-site digital signs, which promote the specific company where they are sited, something never envisioned in previous drafts of this legislation. 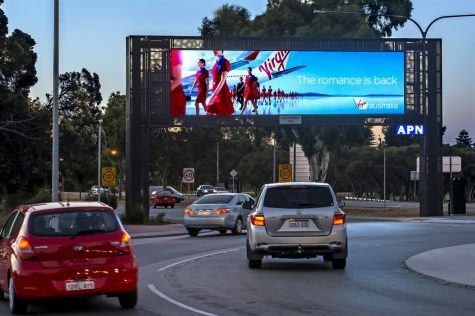 The numerous studies that show a correlation between digital billboards and driver distraction that causes collisions are all being ignored by the PLUM committee. Likewise, the committee is ignoring aesthetic and environmental concerns. But wait, there’s more: Tucked into the language of the bill are a few subtle gifts to sign companies. There is no prohibition on billboards of any kind, digital or static, in city parks. Sign companies could request an exemption to the rules and make any sign up to 20% taller or larger. There’s also a specific exception for the continuation of the huge supergraphic signs in the Greater Downtown Housing Incentive Area, which would be otherwise prohibited elsewhere in the city. This clause of the bill (14.4.24) seems to refer to the supergraphics on the exterior of the Hotel Figueroa, which is located, guess where, in PLUM Chair José Huizar’s district. In sum: If you care at all about urban aesthetics, traffic safety, environmental light pollution, or energy conservation, then you have literally nothing to cheer about in this legislation. It is not final yet, so in the meantime we will be doing all in our power to deflect this missile before it hits its target, which is your eyeballs. Join us by sending your views to the PLUM Committee (Zina Cheng, clerk.plumcommittee@lacity.org). Use the Council File number in the subject line, and request that your comments be added to the record. Public safety, aesthetics, and the will of the people continue to get short shrift at the City Council Planning and Land Use Management (PLUM) Committee, as it caves to the powerful billboard lobby. 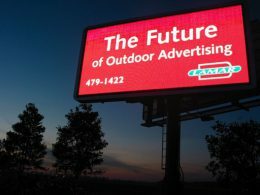 After years of hearings and reports, the committee on May 31 gave instructions to the City Attorney to finally draft a new Citywide Sign Ordinance that will govern billboards, known legally as off-site signs (Council File 11-1705). We should all enjoy the dark night skies while we can, because if this bill becomes a law, digital billboards will be going up in all kinds of new places, flashing messages in our faces every 8 seconds. The committee was working from a draft bill devised by the City Planning Commission (CPC) in late 2015. That draft was a fair compromise between billboard companies, advertisers, and citizens’ rights to a livable and safe visual environment: It permitted digital billboards only in sign districts located in high-intensity commercial zones. Moreover, a company that wanted to erect a digital billboard it had to take down ten times that square footage in traditional static billboards elsewhere. There was no provision for amnesty for any of the 900-plus static billboards in L.A. that lack effective permits. That was then. PLUM has turned the CPC recommendations into something unrecognizable. Digital billboards would be permitted both within sign districts and outside them, in any land use zone that includes the word “Commercial,” which would take in most major streets and intersections. The approval process would be through the relatively loose Conditional Use Permit. Instead of a 10:1 takedown ratio, PLUM would institute a sliding scale, from 2:1 to a maximum of 8:1. The difference in each case would come from contributions by sign companies to city-run fund: they could pay more in order to take down less. The PLUM committee calls this kitty a Billboard Blight Reduction fund, which is deeply ironic. The fees for each billboard would be paid once, but the billboard would reap profits for the company for decades. In effect, PLUM is selling your eyeballs. While the fund is meant to help pay for street improvements, the tradeoff is too great a price to pay for things which the city could and should fund itself through an appropriations process. There are other plums in this pie for billboard companies. PLUM for the first time introduced language to permit digital on-site signage. This is a new subject worthy of an open and transparent conversation with stakeholders from all communities, as new digital signage on storefronts would radically alter community character in many neighborhoods. There has never been any discussion about a policy to permit digital on-site signs and, in fact, CPC intentionally separated the policy discussions of off-site and on-site signage. PLUM also included a provision to allow digital billboards on city-owned property. In sum, the PLUM instructions would allow digital signs both on businesses and on billboards located almost anywhere a sign company might like to have them. Besides the obvious aesthetic arguments against digital billboards, a growing number of studies have shown that they contribute heavily to driver distraction and accidents. Thus, this ordinance flies in the face of Vision Zero, the city’s new program for reducing traffic fatalities. Lurking behind this proposed legislation is a bushel of campaign contributions. Billboard companies in the past have given free advertising space to several of the PLUM committee members (Huizar, Englander, and Harris-Dawson) in support of their election campaigns, and cash contributions to all. In gratitude, PLUM members have practically jumped into their pockets. The final bill will be unveiled sometime this fall. The CPC, probably shocked at what their legislative proposal has become at PLUM, revoked its delegation of the bill in late July. A highly unusual step in city government, this means that whatever PLUM does will have to go back to the CPC for comment and approval. So this struggle is a long way from over.